Bryggerampen - the new elevated cycle track in Copenhagen. New Streetfilm about The Bicycle Snake! UPDATE: JUNE 16, 2014. IT'S ALMOST FINISHED! UPDATE: Now they're calling it Cykelslangen - The Bicycle Snake. Construction starts in Sept. 2012 and it will be open for use in late 2012/early 2013. Unique locations require unique solutions, whatever the city. Construction starts in February on a fantastic and innovative solution to fix an important missing link in the Copenhagen bicycle infrastructure network - Bryggerampen. Bryggebroen - bicycle and pedestrian bridge over Copenhagen Harbour. 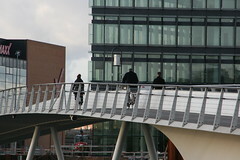 In 2006, a bicycle and pedestrian bridge - Bryggebroen - was opened across the harbour in Copenhagen, connecting the Vesterbro neighbourhood with Islands Brygge on the other side. 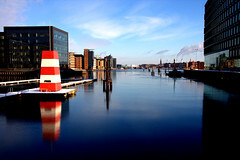 It was the first fixed link over Copenhagen harbour for a few centuries. It was an immediate success. Bicycle users from not only Vesterbro but the rest of Copenhagen were given a faster connection to the island of Amager. Easy access not only to Islands Brygge but also to the universities, Danish Broadcasting and the whole new urban development of Ørestad - as well as bicycle users commuting in the opposite direction. 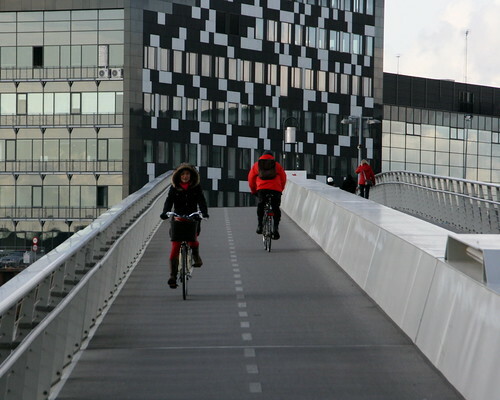 There are currently 8000 bicycle users crossing the bridge each day. That number is estimated to be almost double if it weren't for an irritating missing link on the north side of the harbour. Two options are currently available. You can walk your bicycle down the stairs, using the ramp, to get to the harbourside and on to the bridge or you can cycle a detour around the Fisketorvet shopping centre. Both are a pain. Especially for cargo bike users. Harbour bath on the harbourfront and the Bryggebroen cyclist and pedestrian bridge. In the summer, there is a lot of pedestrian activity on the harbour in this area, with a harbour bath, boat rental, kayak sport and shopping centre customers milling about on the quay. There is no clear division between bicycle users and pedestrians and it is an exercise in weaving to get through to the bridge. In addition, the route involves a couple of sharp corners with limited visibility. All in all, while 9000 people still cycle across the bridge, there were many things to be fixed in order to reach the full potential. Many people ride their bike to the harbour activities, sure, but the majority are just interested in getting from A to B and cycling past this location. Enter the Danish architect firm Dissing+Weitling - who are also the architects behind Bryggebroen and the bicycle bridge Åbuen. 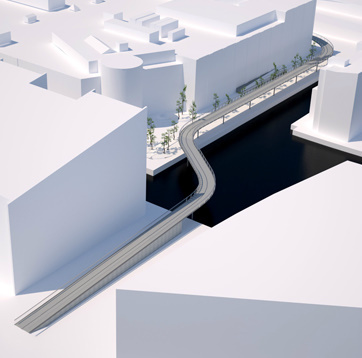 They have designed an elevated cycle track that is, in effect, a 235 metre long bicycle ramp with a gentle slope that will allow bicycle users to travel directly from the bridge at Dybbølsbro to the harbour bridge - Bryggebroen. Separated from cars, of course, but also pedestrians. Below the ramp, people can mill about the harbourfront at their leisure. On the ramp, it'll be A2Bism at it's best. A solution that is typical for Copenhagen. Elegantly designed, practical, incredibly innovative and with bicycle users at the forefront of the concept. 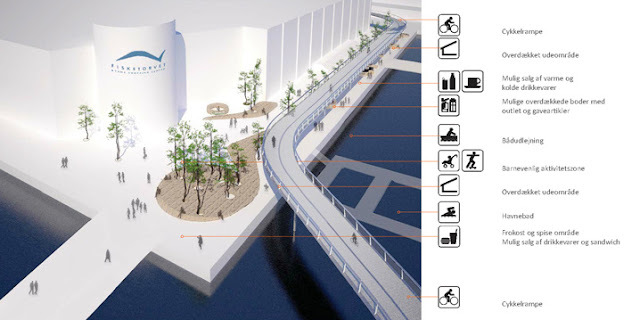 The City sent out a call for ideas and had 20 million kroner for the project. They liked this idea so much that they found an extra 18 million in order to finance it. 38 million kroner in all. That's about $6.6 million or €5.1 million. Here are some of the renderings from Dissing+Weitling. Bryggebroen is at the bottom right and, at top left, is the upper level at the end of Dybbøls Bridge. Here is the Google Map link of this location. It isn't updated so all the new architectural pearls on the triangular Haveholmen aren't on the satellite map. 235 metres in length, with the columns spaced at 17 metres apart. Lightweight - it's only bicycles who are going to use it - and relatively easy to construct. It is planned to be finished in December 2012. It will be bi-directional - not always an intelligent choice for streets - but at 4 metres wide, there will be ample space for bicycles and cargo bikes. An aerial view of how the elevated bicycle ramp will skirt past the shopping centre, above the bustling harbourfront. A gentle slope down to the ground before reaching the start of the Bryggebroen bridge. View from below. A little bit optimistic, because there will still be bicycles along the harbour, but hey. We're looking forward to the completion of the ramp and a doubling in the number of bicycle users crossing the harbour at this point. While it's tecnically a ramp, let's chuck it into the bridge category - along with the many other bridges that are under construction over Copenhagen's harbour like these ones.